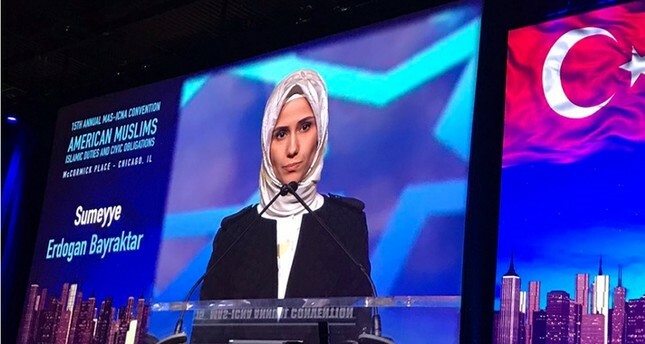 President Recep Tayyip Erdoğan's daughter, the Vice Chair of the Women and Democracy Association (KADEM) Sümeyye Erdoğan Bayraktar speaks in the 15th Annual MAS-ICNA Convention, Chicago, Dec. 26, 2016. President Recep Tayyip Erdoğan's daughter, the Vice Chair of the Women and Democracy Association (KADEM) Sümeyye Erdoğan Bayraktar, said on Tuesday that "FETÖ is a radical group like Daesh and Boko Haram." She spoke at a meeting held in Chicago on the sidelines of the 15th Annual MAS-ICNA Convention, the largest Islamic convention in North America, which she attended as the guest of honor. In the "July 15 and heroes resisting against coup" meeting organized by the Turkish-American National Steering Committee (TASC), Bayraktar warned that the Gülenist Terror Group (FETÖ) is very similar to terrorist organizations and will pose a threat to all Muslims throughout the world if significant steps are not taken against them. Reminding the audience that past coup attempts had achieved their goals and damaged democratic institutions in Turkey, Bayraktar said "In the last coup attempt [July 15], Turkish people showed they would not let another attack, tanks on streets or coup plotters threaten them with the guns that were bought with public taxes." She noted "In the last 15 years, Turkish people have been more interested in politics and democracy, and they stand against tutelage", adding that FETÖ is behind the July 15 attempted coup and the terror group has a distorted understanding of Islam. Bayraktar also spoke about the Western countries' hypocritical stance on the July 15 coup attempt, saying "Although Western leaders express anti-coup discourse and talk about the importance of people's will, they have failed to stand against the perpetrators of the July 15 failed coup attempt. This year's theme for the summit, which is held in Chicago's McCormick Congress Center, is "American Muslims: Islamic Duties and Civic Obligations."